What happens when you go beyond the conventional weave structures? Ask Diane Thorp, who has created her own unique form of textile art by weaving a deconstructed canvas painting onto a painted warp. Diane has a strong weaving background and yes, she paints as well. Recently Diane Thorp and Sandy Bligh held a show at the Community Arts Council of the Saanich Peninsulas's (CACSP) gallery at Tulista Park in Sidney. It was inspiring to see these two artists at work in a studio like atmosphere with the bright array of their work adorning the walls of the gallery. 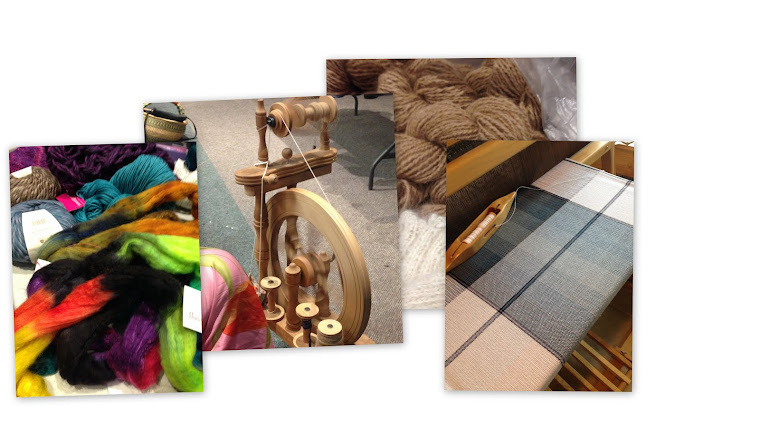 The Deep Cove Weavers and Spinners Guild is pleased to have Diane Thorp come to our February 18th meeting to share stories of her journey from basic weaving to her AVL Dobby production loom and the inspiration for her new canvas weavings. A sample of Diane's work. A reminder to DCWS Guild members that March 25th will be the unveiling of the Flower Power Challenge. Bring your finished work along with what inspired you and a story to tell about your creation. Look forward to a posting of the submissions and the prize winners!